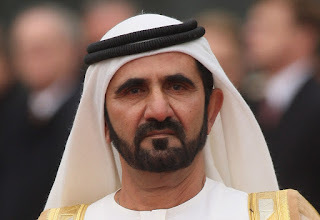 Dubai: An initiative to encourage students in the UAE and Arab world to read was launched by His Highness Shaikh Mohammad Bin Rashid Al Maktoum, Vice-President and Prime Minister of the UAE and Ruler of Dubai. “The initiative’s annual target is for 50 million books to be read, and this will be achieved through a million students committing to read 50 books per school year. We have also launched an incentive programme for students, supervisors, teachers to participate in ARC,” added Shaikh Mohammad on Twitter. The student who places first in ARC will be rewarded $150,000, which will be granted as $100,000 for university tuition fees and $50,000 granted to the student’s family. Iranian woman footballer Niloufar Ardalan has been banned from playing in an international tournament by her husband, according to reports. The 30-year-old, nicknamed Lady Goal, is unable to attend the Women's Futsal Championship because her spouse reportedly refused to release her passport. He seemingly wants her to be at home for their son’s first day at school. “My husband didn't give me my passport so that I can (take part) in the games, and because of his opposition to my travel abroad, I [will] miss the matches.” Ardalan told Nasimonline. 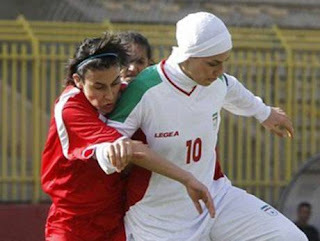 “I wish authorities would create (a solution) that would allow female athletes to defend their rights in such situations. The six-day Asian Football Federation tournament begins on Thursday in Nilali, Malaysia. Moscow: Syrian President Bashar Al Assad rejected calls to step down and criticised the US and its European and Arab allies for not coordinating with him on the fight against Daesh as hundreds of thousands of refugees flee the civil war in his country. More than 250,000 people have died in the Syrian conflict since 2011, which has traumatised the Middle East, spilling into its neighbours, and provoked an exodus of refugees seeking safety in the European Union. While Daesh controls as much as half of Syria, rebel militants trying to oust Al Assad backed by the US, Saudi Arabia, Turkey and Qatar are also gaining ground. A coalition led by the US to fight Daesh isn’t coordinating its actions with Syria and hasn’t contacted the government since last year, according to Al Assad. “We’re fighting, if it’s possible to say, a common enemy, striking the same targets in the same places without any coordination,” Al Assad said. Syria is ready to collaborate with Turkey, Qatar, Saudi Arabia, France, the US and other states, if the countries focus on fighting terrorists and stop shielding them, according to Al Assad. 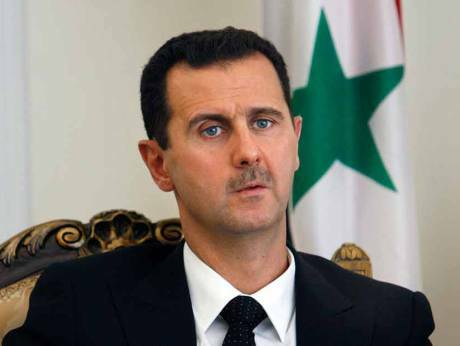 The US and Europe have said Al Assad can’t be part of a solution. Russia’s continued support for the Syrian leader “risks exacerbating and extending the conflict, and undermining our shared goal of fighting extremism,” US Secretary of State John Kerry said in a phone call on Tuesday with Russian Foreign Minister Sergei Lavrov, according to a State Department statement. The US “would welcome a constructive Russian role” in combating Daesh, while Al Assad “could never be a credible member” of the coalition, Kerry said, according to the statement. Russian military aid to the Syrian government “only contributes to the spiral of violence,” French Prime Minister Manuel Valls said at the start of a parliamentary debate on Tuesday about extending France’s part in the US-led air campaign against Daesh. While Russia has sent signals to the US and Saudi Arabia that it may allow Al Assad to be eased out of power, according to officials, Russian President Vladimir Putin said Tuesday that the fight against Daesh should be the global community’s top priority in Syria, rather than supplanting the regime. Russia is escalating military aid to Syria, which hosts the only Russian naval base outside the former Soviet Union, and is building a new air hub in the Middle East nation, according to the US. 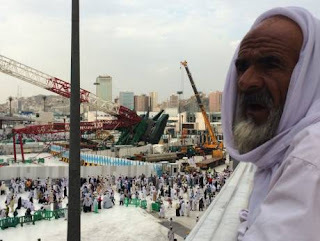 Manama: Saudi Arabia’s King Salman Bin Abdul Aziz Al Saud on Tuesday ordered that the families of those killed in Friday’s crane collapse at the Grand Mosque in Makkah each be paid one million riyals in compensation. The families of those who suffered permanent injuries will also be paid one million riyals each, the king ordered. Those who sustained less serious injuries will receive 500,000 riyals, according to the royal order. The financial compensation does not rule out the possibility for the victims or their families to file lawsuits. The injured worshippers who are physically unable to perform pilgrimage this year will be invited for next year’s pilgrimage as hosts of the king. Relatives of those hospitalised will be given special visas to visit them and stay with them until the end of the pilgrimage season, which will end on September 28. Two relatives of each victim will be hosted by King Salman to perform pilgrimage next year, according to the royal order. The compensations are part of wide-ranging decisions issued at the conclusion of the investigation launched immediately after the collapse of the giant crane on Friday afternoon when the Grand Mosque was teeming with thousands of worshippers, and in which 107 were killed and 238 were injured. London: Based on web traffic, social media metrics and estimated online readers (>100 million in 2015), the QS World University Rankings has been released late on Tuesday. It is, by far, the most popular annual league table of world universities. 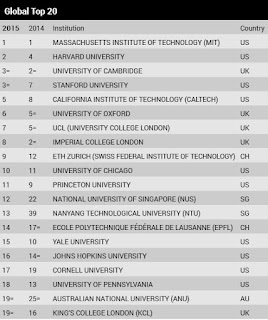 The twelfth edition of the QS World University Rankings 2015/16 confirms the Massachusetts Institute of Technology (MIT) as the world’s top university followed by Harvard (2nd), The University Cambridge and Stanford University (3rd=). 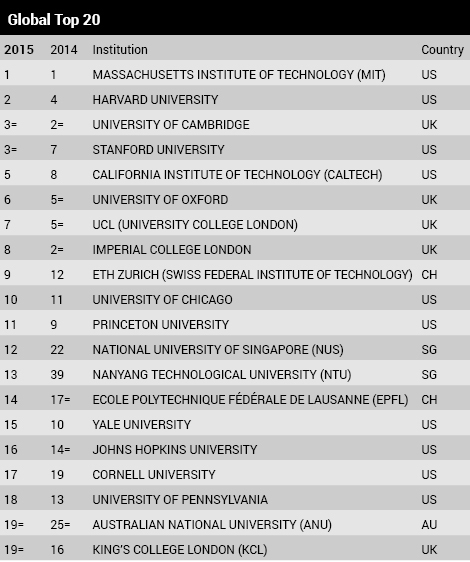 ETH Zurich (9th) breaks into the top 10 while the sharpest rise in the top echelon of the table is for the two leading Singaporean universities which make the top 15 for the first time ever. The National University of Singapore (12th) is the leading Asian institution while Nanyang Technological University (13th) takes a quantum leap, nearly closing the gap with its domestic rival. 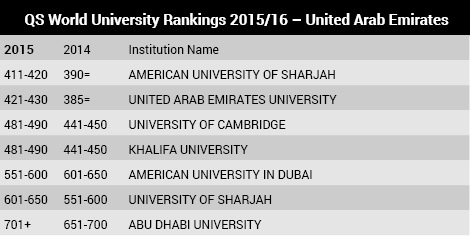 Australian National University (19th) also returns to the top 20. 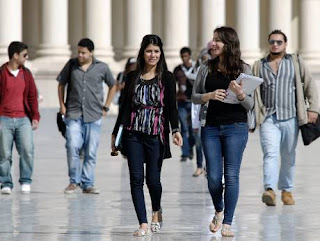 Meanwhile, the United Arab Emirates sees six universities placed on this year’s ranking, the same number as the previous year. 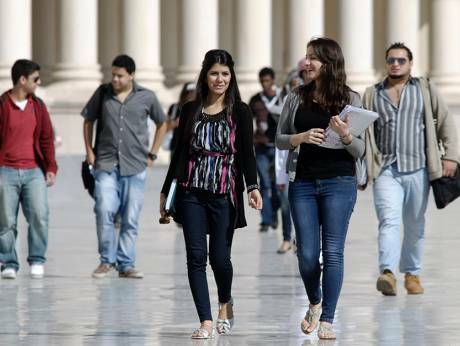 This represents a stable overall performance for UAE’s Higher Education institutions. Leading the way is American University of Sharjah (411th-420th band), followed by the United Arab Emirates University (430th) and Khalifa University (481st-490th band). 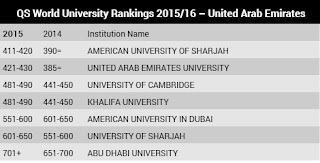 Five universities see small rankings decreases, while the American University of Dubai (551st-600th band) sees a small increase to break into the top 600 worldwide. Dubai: A higher salary increase is still on the cards for some employees in the UAE next year, although the impact of falling oil prices can now be felt across the Gulf Cooperation Council (GCC) region, according to a new report. Based on a survey of 600 multinational companies and locally-run conglomerates in the GCC, Aon Hewitt has forecast salary adjustments in the UAE to average 5 per cent in 2016, higher than the 4.8 per cent forecast and actual increase implemented this year. Across the region, however, a slowdown is expected, with increases forecast to average 5 per cent, down from an anticipated 6 per cent in 2013, 5.5 per cent in 2014 and 5.1 per cent in 2015. Aon Hewitt said that the recent moves to cut back on government subsidies and infrastructure spending, as well as the widely publicized plans to implement taxes, are putting pressure on profit margins and operating costs of companies. The UAE has recently removed oil subsidies, causing pump prices to increase, amid concerns that falling fuel prices could hurt government finances. There have also been discussions about a proposal by the International Monetary Fund (IMF) to collect value-added tax on consumer goods and services. “Clearly, the impact of lower oil prices can be felt across the region, with governments cutting back on subsidies, reducing spending on larger projects and thinking about introducing some form of taxation,” Aon Hewitt said in a statement on Tuesday. Robert Richter, GCC compensation survey manager at Aon Hewitt Middle East, noted that the overall outlook for 2016 is not as rosy as recent years. “But the news that employers are predicting salary increases in the 5 per cent range should come as a comfort to employees, suggesting that there is still optimism in the market,” Richter said. Kuwait companies lead the region in highest level of salary increase at 5.2 per cent. The forecast, however, is slightly down from the 5.3 per cent predicted for 2015. Salaries in Kuwait rose by 4.7 per cent, on average, this year. Saudi Arabia comes second, with salary adjustments forecast to average 5.1 per cent, followed by UAE, Qatar and Oman, all at 5 per cent. Workers in Bahrain are likely to receive the lowest salary increase at 4.7 per cent, down from the 4.5 per cent forecast for 2015. Abu Dhabi: Eid Al Adha holidays for employees of ministries and federal government departments will be from Wednesday, September 23, 2015 and work will resume on Sunday, September 27, 2015, according to a circular issued by the Federal Authority for Government Human Resources. The Ministry of Labour has declared Wednesday, September 23rd, until Friday, September 25th, an official paid holiday for all workers in the private sector to celebrate Eid Al Adha. Work will resume on Saturday, September 26.